This page describes the conditions of use and privacy notice of this open web site. – We will confirm your subscription within 3 working days. – The invoice of your subscription will be delivered via e-mail. – We add the costs of shipment to the invoice. That’s 5,00 euros. – Subscriptions over 30 euros will be sent without those shipment costs. – The delivery will be sent out via postal service. All the content of this website if not mentioned otherwise is © Osakekirja.fi Oy 2003-2018. – We don’t take any responsibilities about the content of sites linked from our website. – We don’t take any responsibilities – neither ethical nor material – if the content of our website is modified via illegal actions or cyber hack. – The content of our website may contain technical or issue-related mistakes nor can we provide responsibility of avoiding these mistakes 100%. – The content of our website is not be seen as committed offers, suggestions, or other ways made commitments, if not mentioned otherwise. The customer is responsible for the rightness of the information provided to osakekirja.fi (scripophily.fi). In case the information provided by the customer is not accurate, osakekirja.fi (scripophily.fi) doesn’t have any responsibilities towards the losses of the customers. Osakekirja.fi (scripophily.fi) has right to save and analyse the data of customers at osakekirja.fi (scripophily.fi) in order to make the comfortability of customers at the website of osakekirja.fi (scripophily.fi) better. Osakekirja.fi (scripophily.fi) has also right to acquire the information for these kinds of analyses from the third parts. However the anonymities of individuals are in both cases secured. The English pages of the osakekirja.fi (scripophily.fi) are a mirrors of the Finnish-language sites of osakekirja.fi. The primary updates, most informative pages, additional stories etc. are focused to the pages of osakekirja.fi in Finnish. Personal Data Act (GDPR) section 10 and 24. Updated 12.05.2018. Osakekirja.fi Oy / Scripophily.fi, P.O. Box 144, 00181 Helsinki, FINLAND. Auction customer register of the Scripophily.fi (excluding Scripophily auctions). Personal information is used only for arranging online-shop orders including billing. Personal information eg. name, address, phone number and e-mail address. Data is kept until the end of the order processing, and no permanent client register will not be collected. However, data can be saved on accountancy and other authority related purposes along legislation. At the order or other contact directly from customer. Personal data can be provided only to those third parties, which need particular contact information to fill orders. The printed information is secured in locked rooms. The computer coded information is secured in the web behind the passwords, available for the crew of osakekirja.fi (scripophily.fi) only. 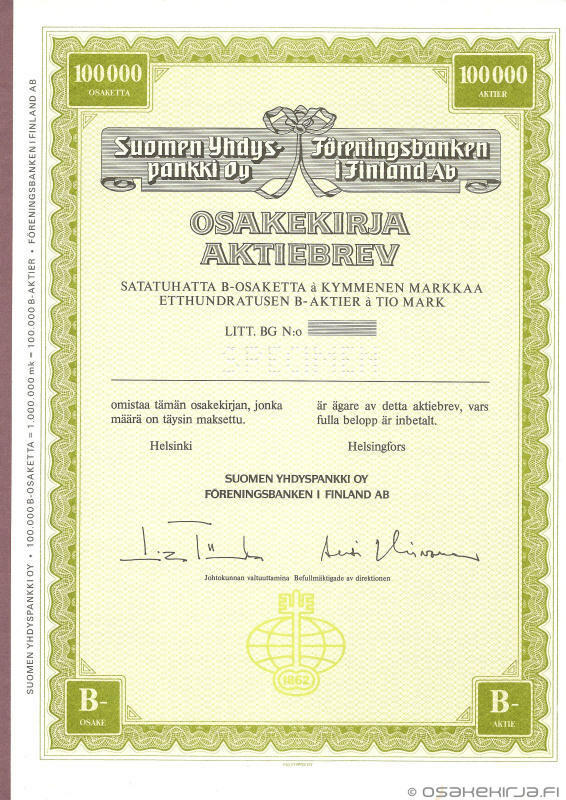 The allowance of using either information is strictly for business between osakekirja.fi (scripophily.fi) and the customer only. The person has the right to check the data stored in the registry and get copies of them. Every person in the registry has an account in the auction system where (s)he can independently change his or her personal information and print his or her purchase and sales history. A written request for verification must be made in writing and addressed to the person responsible for the registry.